ECGC, Export Credit Guarantee Corporation of India Limited invites application forms from eligible candidates for the recruitment of Probationary Officers posts. As per notification of ECGC, Export Credit Guarantee Corporation of India Limited Total no. of posts is 52. Application mode is online. Online application forms will be available from 05th October, 2016. Last date for online register process is 26th October, 2016. The official notification has been uploaded and the information regarding these posts of educational qualification, age criteria, selection process etc is mentioned below. Candidates may download official notification from below link. 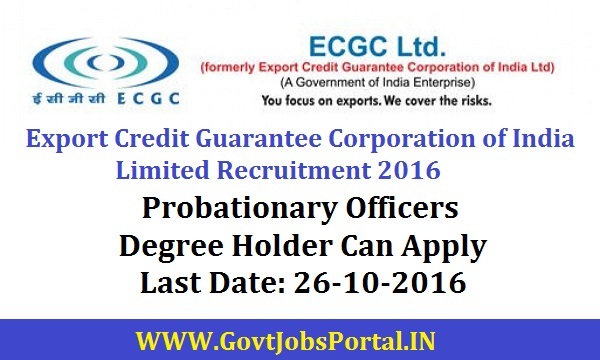 Read information for ECGC, Export Credit Guarantee Corporation of India Limited recruitment 2016. Staring date for submitting application forms online is 05th October, 2016. Closing date for submitting application forms online is 26th October, 2016. Eligible candidates must have the Qualification will be Master Degree/Post Graduation in the required discipline from a recognized University . Check the official detail for the complete detail. Candidates should have their age between 20 to 30 years. Otherwise they will not eligible for Recruitment process. Application fee (non-refundable) for candidates belongs to UR/OBC category is Rs. 600/- SC/ST/PWD category candidates have to pay Rs 100/- as Application fee. Engagement of above positions would be depended on Online exam , Descriptive Test, Intervew. A) These all posts can be applied by online process. First you have to go on website link given below. C) Click on online apply button and you will see application form fill this form with truly based information must by following tips in this section.